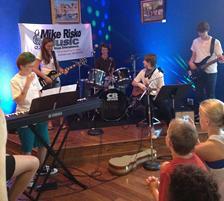 This band rocked the house! Rehearsing on our stage with professional sound equipment and lights is a great way to build confidence for the show. 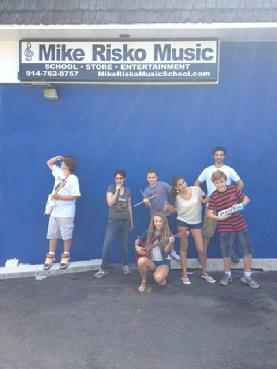 Rock Band Camp at Mike Risko Music 2012 was our most exciting year yet! 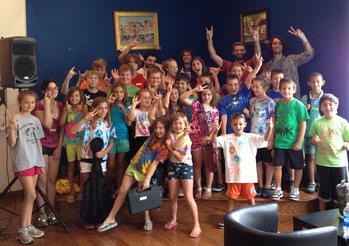 With camp filled to capacity, we had a full house for our show and a really exciting week leading up to it. Activities like crazy hat day and rock star day gave our rockers the opportunity to really build confidence for the concert. 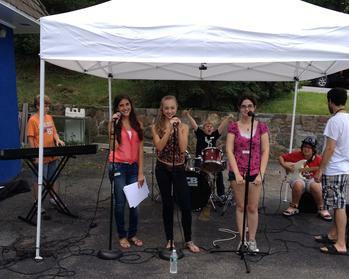 Each band wrote three amazing, catchy tunes that they performed at the show and they opened the show with a flash mob dancing to Call Me Maybe. It was so much fun that all the parents were dancing too! It is so great having space outside to run rehearsals on a beautiful day! 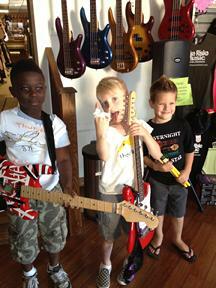 One big happy rock band family! 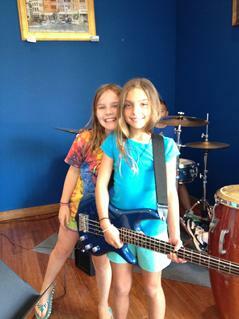 Each band gets to participate in a photo shoot and come up with a pose for their promo pics. Making friends is what it is all about!